Train control is provided with Aristo-Craft remote control throttle units. They provide basic "track" control for each of the four lines independent of each other. The basic operation for train shows is to runs trains!! Switching has been an very optional part of show operations. The Branch line ( 3rd track in from the edge ) and the Mountain line ( 4th and elevated track from the edge ) provide almost all the switching sites on the modules at present. Switching operations will be a future area of interest for us as the membership increases and the number of new modules come on line which could provide more areas for operations. 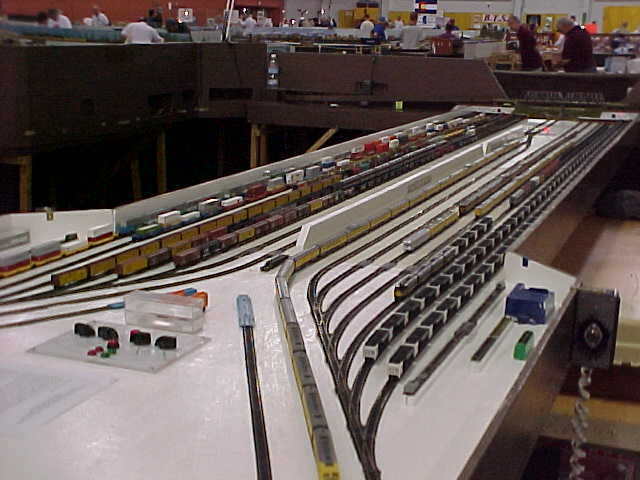 A future outside large switching yard is planned for the club and could be online for the 2002 N-Trak convention which is coming to the Northwest. Some club members have included switching on their modules which can be done separately from the main N-Trak tracks. 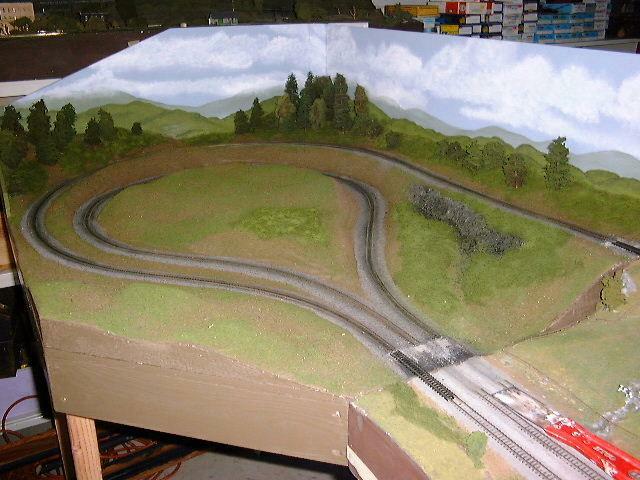 This will become more interesting as the club develops and a possible "home " for the layout is provided where we can do "operations" and besides just run trains. The West end loop prior to major scenery. The grade up to the mountain line can be seen going from the outer line around and up to the 3 1/8 inch elevation of the mountain line. The East end loop with some photo enhanced scenery, not much. This hill scene created a small enough visual block that the merri-go-round effect was avoided. Jim Younkins did the major work on these loops and did a super job. Alcos can smoke that much I've been told. The staging yard... looking back towards the Ballard Why. The 12 tracks are mostly full at the NMRA Convention @ San Jose. Winton Hazelton's Rosebud unit coal train is in the foreground with over 110 cars ready to roll. Win has painted and applied custom decals to hundreds of cars and engines with the Pacific Northern scheme which he has designed and produced. Mt. Rainier N Scale has adopted the International operational practices that N-Trak developed, three tracks connected at the outer edge of the modules, plus our club uses the optional mountain line, 3-1/8th inches above the other tracks and at the rear of the module, for our basic layout . The mountain line allows running additional trains and increases the amount of action for the public, since that's what show operation is all about. The most common and operationally friendly arrangement is a rectangle using our club's modules, which include, a wye for the three outside tracks, that provides access to Hazelton Yard modules and a double loop for the mountain line to access the yard. The yard modules, which are a 3 module set measuring 18 feet long, have two separate yards to stage trains and an independent passing loop which can reverse train direction or bypass the yard completely, if needed. It also, includes a short test track, coupler alignment fixtures and wheel cleaning area. It has the capacity to hold 600-800 cars depending on car length. The yards also have independent track controls from the Aristo-Craft throttles with the option to run from any outer N-Trak powered line directly into the yard track. This allows quick and easy transition of two trains, usually at the same time, to the main tracks on the Ballard Wye. The modules ( 2each-2'x 6') from the yard out to the member's modules is called "the Ballard Why". It controls the train movements to the selected tracks and interlocks the other tracks, if needed, to prevent "crowd pleasers". A recent club project produced two end loops which allow the club to setup without the staging and Ballard Why in order to show at sites with limited floor space. These modules connect the outer main to the mountain line by means of a 2-2.5% grade. The inner main and the branch are connected to each other also. At the first outing of the loops the show coordinator didn't know how much space he would have for us until show setup. This is very unusual and would normally mean we would not attend this affair, since each show requires advanced planning for setup and travel. But, with the loops we had extreme freedom to setup however the space permitted at the very last minute. This is what we had to do and the result was an elongated "U" that was 48 feet long and 8 feet deep with the back open to a wall. It worked great with the only shortcoming being that only two operators could run at a time instead of the usual four with our standard N-Trak layout.